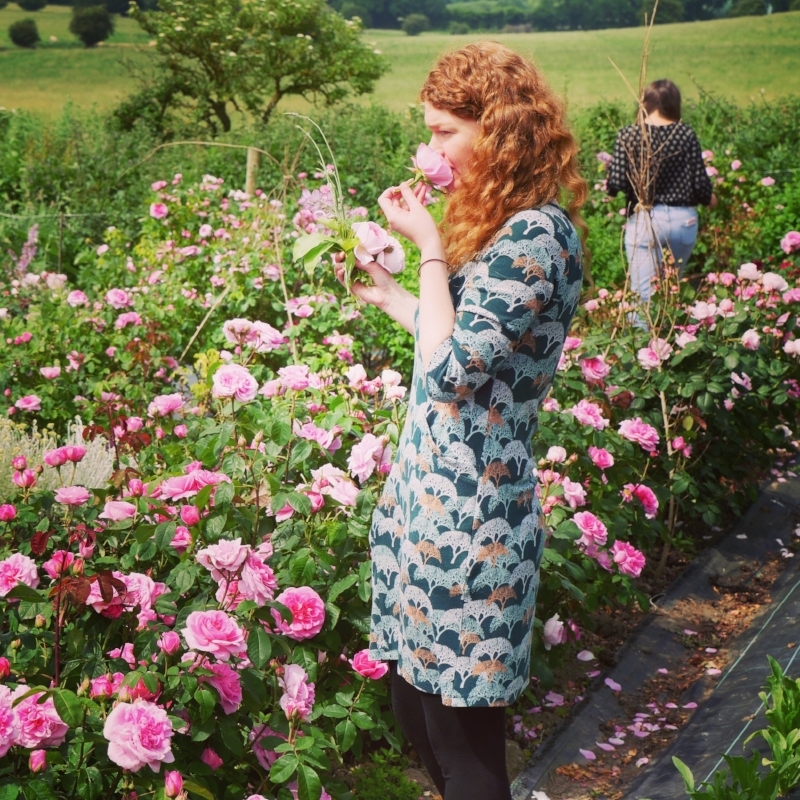 Once a year in June, when our Roses are in full bloom, I throw open the doors of the barn and welcome in the intrepid group of people who want to experience the absolute joy of wild perfumery. It's a day of immersion in scent, an invitation to be liberated from the constraints of convention and feel the excitement of plantwork. This year, in spite of a horrible forecast the sun shone and, after the initial reticence that comes from years of being told to 'look but not pick', the perfumistas threw themselves into collecting scented flowers, leaves and anything else they could find. They drifted amongst the Roses, picking the open flower heads, marveling at the different scent profiles. They gathered bunches of Lemon Balm, Violet leaves, Chamomile, Tansy, Artemisia, Geranium, Lavender and Helichrysum before heading out across the farm in search of Elderflowers and other hedgerow beauties. Botanical perfume, of the kind you made as a child with mashed up petals, can be incredibly pleasing in the right hands in sensitively measured proportion. Making it restores the child-like joy of being amongst the plants and offers a scent that is immediately arresting. It is as far from an industrial manufactured perfume as you can imagine and its complexity and lightness is utterly refreshing. Henrietta mixing botanicals for scent before tapping them for scent. What I love to do is to place chosen botanicals on fabric and gently bash them to break open the essential oil glands and release the scent. It is quite wonderful to take a handful of petals, leaves, twigs and roots and place them carefully on cotton, linen or silk, before tapping out the oils. After removing the plant matter both the colour and scent is revealed. It can then be layered with more plants for succesive iterations so as to produce a beautifully perfumed and patterned handkerchief. The scent doesn’t stay for long but that is part of the charm. We seem to have lost our love of fleeting scent in favour of phthalate rich perfumes that ‘stick’ the fragrance to your skin for hours on end. Having made a maceration of fresh middle notes, it is intriguing to add a few drops of top and base notes. We used essential oils and special resins from my collection, to turn their perfumes into rich rounded enveloping scents. Spritzed delicately on to the hair it lasts well or sprayed onto a base of applied jojoba oil helps to hold it a little longer, but for me, the pleasure is in the re-application. To keep a little perfect bottle in a pocket or bag to be dabbed on at will is a joyful reconnection to the scent. It offers something that no modern perfumery can, a direct connection to the plants that were chosen, picked and blended moments before. It forms a direct relationship to the memory of the plants, days and weeks after, when you spray it on your skin and inhale that first breath of botanical alchemy. The beauty of perfume is the memory it evokes – a long forgotten scent of a parent, a grandmother’s garden, a particular tree or flower, a fruit or leaf, a love, a loss, a heart broken or healed. It is powerful indeed. Making your own perfume with plants and petals, oils and tinctures is magical. As the petals succumb to the gentle mixing and give up their scent, the synergy creates a scent redolent of a particular time and place. I often make for a particular moment, event, a mood or sensation that I want to capture to return to in a quiet moment of contemplation – whether it be the orange blossom and heat of a Cypriot day, the cool green of a Scottish summer, the heady scent of Roses from our Sussex distilling garden or the memory of a walk, even the scent of Lewes bonfire night mixed with our tree resins is a gorgeous earthy note. and the rain comes in the wake of the summer. greet me and speed along the road. and the breath of the passing breeze is sweet. the happy moment will arrive when I shall see. In the meanwhile I smile and I sing all alone. In the meanwhile the air is filling with the perfume of promise.